Brown A.M.E. Chapel (in front of you) served as a safe haven for supporters during the voting rights campaign. Pastor P.H. 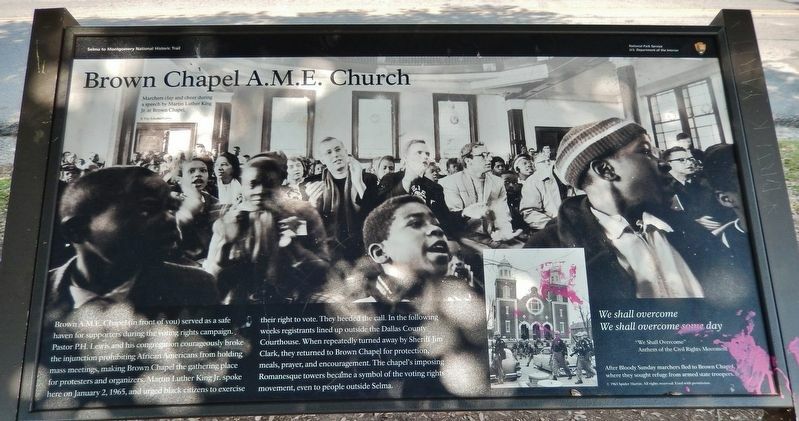 Lewis and his congregation courageously broke the injunction prohibiting African Americans from holding mass meetings, making Brown Chapel the gathering place for protestors and organizers. Martin Luther King Jr. spoke here on January 2, 1965, and urged black citizens to exercise their right to vote. They heeded the call. In the following weeks registrants lined up outside the Dallas County Courthouse. When repeatedly turned away by Sheriff Jim Clark, they returned to Brown Chapel for protection meals, prayer, and encouragement. The chapel's imposing Romanesque towers became a symbol of the voting rights movement, even to people outside Selma. Martin. All rights reserved. Used with permission. Marker series. 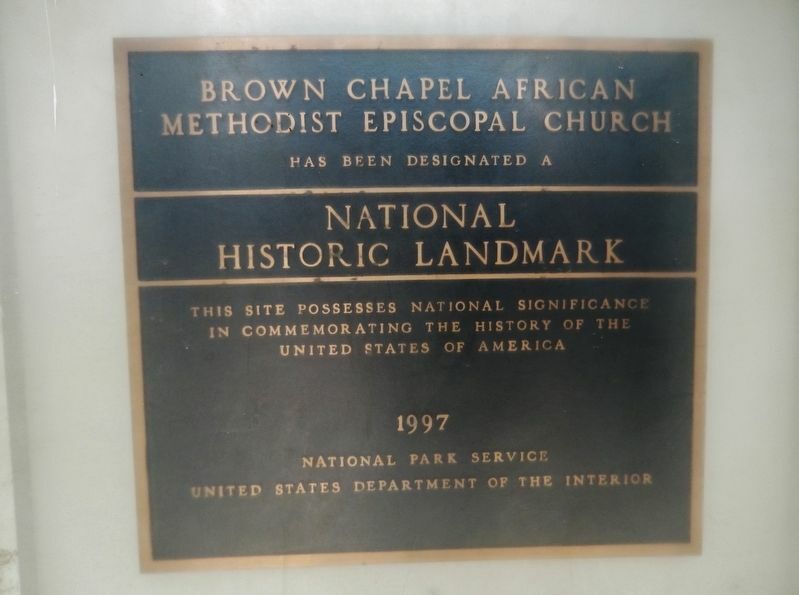 This marker is included in the Martin Luther King, Jr., and the National Historic Landmarks marker series. Location. 32° 24.741′ N, 87° 0.989′ W. Marker is in Selma, Alabama, in Dallas County. Marker is on Martin Luther King Street 0.1 miles south of Clark Avenue, on the right when traveling south. Touch for map. 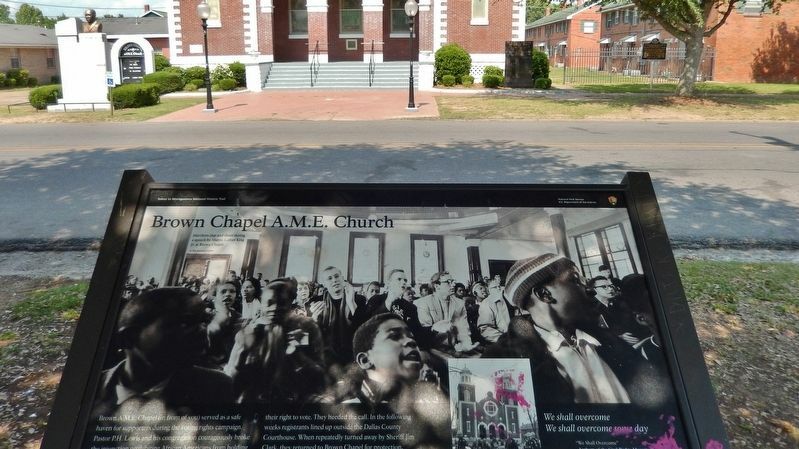 Marker is located directly across Martin Luther King Street from Brown A.M.E. Church. 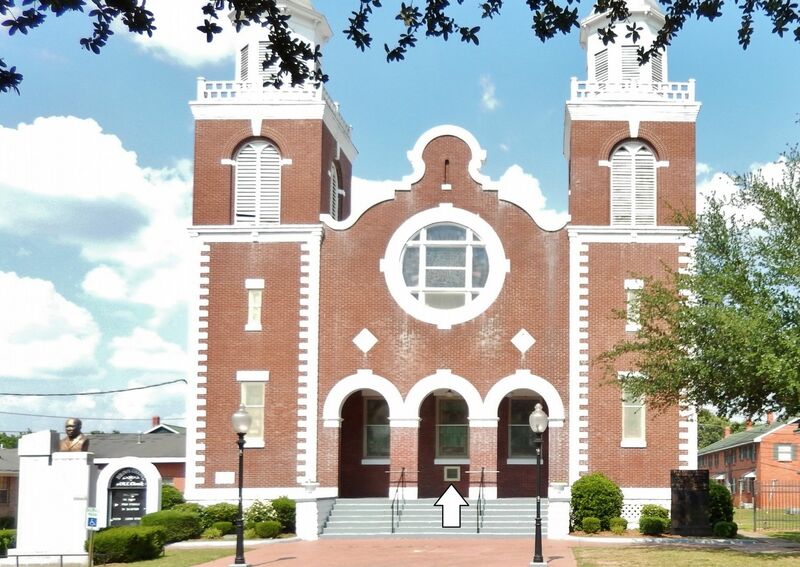 Marker is at or near this postal address: 410 Martin Luther King Street, Selma AL 36703, United States of America. Touch for directions. Other nearby markers. At least 8 other markers are within walking distance of this marker. Sanctuary to Stage (here, next to this marker); I Had A Dream (a few steps from this marker); George Washington Carver Homes Projects (within shouting distance of this marker); Lewis Scott (about 400 feet away, measured in a direct line); George Washington Carver Neighborhood (about 600 feet away); First Baptist Church (approx. 0.2 miles away); Turning Point (approx. 0.2 miles away); A Grassroots Movement (approx. 0.2 miles away). Touch for a list and map of all markers in Selma. Regarding Brown Chapel A.M.E. Church. More. Search the internet for Brown Chapel A.M.E. Church. Credits. This page was last revised on April 12, 2019. This page originally submitted on April 10, 2019, by Cosmos Mariner of Cape Canaveral, Florida. This page has been viewed 47 times since then. Photos: 1, 2, 3, 4. submitted on April 11, 2019, by Cosmos Mariner of Cape Canaveral, Florida.